Guild History – The Embroiderers' Guild, Queensland Inc. In 1964, Queensland members of The Embroiderers’ Guild of New South Wales began to meet monthly in each of their private homes within Brisbane. When numbers became too numerous to accommodate home meetings, the group met at 5 Windsor Avenue, Lutwyche, which, at this time, operated as an embroidery supply shop. Towards the end of 1967, the group numbered around 30 and enquiries were made to the parent Guild in London regarding the procedures for association. In May 1968, The Embroiderers’ Guild, Queensland Inc. formed, with Mabel McAlister OAM elected as the Guild’s first President. By the end of 1968, membership had risen to just under 100. Meetings continued to be held monthly at Windsor Avenue, Lutwyche. The Guild continued to expand, with meetings becoming more popular. The venue at Lutwyche could no longer contain meeting numbers. In response, the Guild rented a first-floor room in the Drysdale Building at 4 Wickham St, Petrie Bight. Twenty members attended the first city meeting in February 1969 but, by 1971, Guild numbers had surpassed what the Drysdale Building could comfortably seat. During the 1970s, the Guild found lodgings at Webber House, a heritage-listed church hall within the grounds of St John’s Cathedral, Brisbane – and for a brief time at the South Brisbane Town Hall. 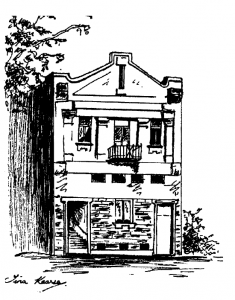 In the early 1980s, the idea of the Guild incorporating and buying its own building gained traction. The members of the EGQ felt that they required a permanent space in which to conduct their various activities. In 1983, the Guild successfully applied for incorporation and its next mission was to locate a suitable and permanent home. 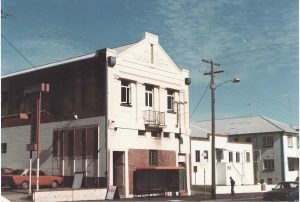 At an Extraordinary General Meeting held on 9 June 1983, the Guild commenced negotiations to purchase the Masonic Temple, situated at 149 Brunswick Street, Fortitude Valley. The Guild approached the Masonic Committee with an offer of $110,000. Concurrently, the Committee received another offer of $100,000 from another committee representing a children’s theatre group. The Masonic Committee accepted this other offer. The Guild was advised ‘that, being a women’s group, the Guild would not be able to finance the purchase’. Undeterred, the Guild wrote to the Masonic Committee to formally advise that, should the other sale not proceed, it would be willing to put forward another offer. Only a week later, the other contract fell through. The Guild submitted a revised offer of $100,000 which was accepted by the Masonic Committee. Fund raising for a central meeting place was always high on the agenda and the earlier members of the Guild worked extraordinarily hard to achieve this aim. By July 1983, the EGQ had raised almost $25,000. The Queensland Government awarded the Guild a grant of $50,000 in October 1983 towards the building’s purchase; and a loan to cover the balance was later approved by the Westpac Bank. Through determination and sheer hard work, this loan was paid off in five years by Guild members or as they had previously been referred to as ‘this women’s group’. 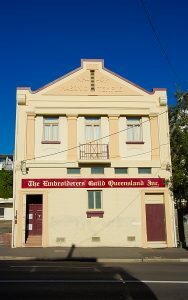 The site located at 149 Brunswick Street, Fortitude Valley, Queensland 4006 has had two very distinct histories which reflect the two divergent custodian groups that have owned the building. On 27 May 1922, the foundation stone of what was to become Lodge Tullibardine of the United Grand Lodge of Freemasons was laid. A news article at the time (May 1922) reports that ‘the (foundation) ceremony was performed by the most worshipful T.S. Barstow, Past Grand Master. The stone was tested by the wardens and corn, wine and oil each having special significance were poured on it. Beneath the stone were placed copies of the daily papers, coins of the realm, masonic journals and a history of the lodge’. These items were contained in a leaden sealed casket. The building was completed by September 1922 with a dedication and consecration ceremony held on 28 September 1922. At the time of its construction, Lodge Tullibardine was described as a two-story building, comprising a ‘handsome lodge room with necessary auxiliaries’ on the upper floor, and a ‘banquet and harmony hall’ on the ground floor. The building was fronted by a shop with an awning spanning across the pavement to protect both the Lodge entrance and the shop. The architect was named as Brother Wightman, with the building contractors identified as Messrs MacArthur and Walker. Brother Wightman was in fact Thomas Blair Moncrieff Wightman, a renowned Brisbane architect. He was a Councillor of the Queensland Institute of Architects and became President of this association from 1923-1924. In 1927, Thomas Wightman was elected a Fellow of the Royal Institute of British Architects. He is acknowledged in the Queensland Heritage Register as creating designs that were well regarded within the Brisbane community. His residential work is considered important because it assisted in the development and changing face of interwar domestic architecture in Queensland. When the Guild purchased 149 Brunswick Street (in late 1983), the then 61-year-old building had been vacant for several years and was in a state of disrepair. In 1984, renovations were necessary before the Guild could permanently occupy the building. On Saturday, 20 April 1985, the Guild rooms were officially opened by the then Patron, Lady Campbell, wife of Sir Walter Campbell (who became Governor of Queensland on 22 July that year). The official opening was celebrated with an exhibition of members’ work and a fashion parade by an upcoming designer, Daniel Lightfoot. Unfortunately, the awning and shop were demolished well before the Guild purchased the property. All that remains of the shop now are the wooden doors to the right of the building’s exterior. The renovations undertaken by the Guild were sympathetic to the building’s Masonic past. Visitors to the Guild can continue to marvel at original joinery and carpentry work. The building with its very high ceilings, high windows and extensive wall space is ideal for the display of embroideries. The kitchen and dressing room on the lower level were renovated, with the kitchen’s original tessellated flooring restored. While the platform and side seating in the ‘banquet and harmony hall’ were removed, visitors only need to climb the stairs to see Masonic timber benches lining what had been the previous lodge room. The original long cupboards that once housed Masons’ robes also remain. Both spaces provide the Guild with much needed storage. The site at 149 Brunswick Street is now a recognised Heritage Building in the Fortitude Valley Brisbane City Council Heritage Precinct. The former Masonic Lodge has adapted well to its changing history. The Guild has now achieved a permanent home and is a solace for those who love embroidery. The building is a centre for fostering friendships and collegiality, and an attraction for visitors. The building at 149 Brunswick Street is well used by members of the Guild. The Guild has a library with an extensive collection of books and magazines on all facets of embroidery and patchwork. It also owns a substantial collection of needlecraft and embroidery related heirloom pieces. Over 3,000 items are currently catalogued in the Collection. Pieces are exhibited on a regular basis in the display cases. The Guild’s Collection has been presented with a Community Heritage grant from Canberra, which enabled it to be assessed and recognised as a Nationally Significant Collection. The Guild’s first large exhibition of embroideries and quilts was held in Brisbane in 1974. Large exhibitions continue to be held biennially. Smaller displays, talks and demonstrations are ongoing activities. While these activities are normally conducted in-house, the Guild has supported other organisations including (most recently): The State Library, Miegunyah (Queensland Women’s Historical Society), Newstead House and Artisan. For the Australian Bicentenary (1988), the Guild was invited to complete the Queensland section of the Parliament House embroidery, now housed in the new Parliament House in Canberra. In 2018, two Guild members completed a commission for Queensland Government House. One of the Guild’s objectives is to promote the art of embroidery and allied arts. As a means of achieving this object, classes are conducted at the Guild regularly by in-house tutors and by visiting local, interstate or overseas tutors. Classes are diverse and the techniques covered have included Crewel Work, Mountmellick, Stump Work, Gold Work, Hardanger, Casalguidi, Pulled Thread, Candlewicking, Black Work, Canvas Work, Elizabethan, Wool Embroidery, Shadow Work, Richelieu, Creative Embroidery, Ribbon Embroidery, Counted Thread, Ayrshire, Brazilian, Appliqué, Smocking, Needle Lace, Madeira, Bead Work, Machine Embroidery, Design – and many other forms of embroidery. Classes for Young Embroiderers are held each vacation and are also extremely popular. Craft Fairs are held within the rooms each April (in preparation for Mother’s Day) and November (in preparation for Christmas) and attract many visitors to the Guild. A newsletter is published 11 times a year. A permanent space also allows groups of members to meet throughout the week. These regular meetings provide fellowship for members of all ages, who can be both experts and beginners in embroidery. Currently, there are more than 250 Guild members throughout Queensland. The Guild has affiliated branches in Toowoomba (commenced in 1969), Southport (1972), Gladstone (1983), Noosa-Cooroy, known as Wallace House Noosa Branch (1983), Rockhampton (1987), Sunshine Coast (1995) and Capricorn Coast (1995). In 1993, Miss Mabel McAlister, a founding member and our first President, was awarded the Order of Australia for service to The Embroiderer’s Guild Queensland, Inc. Prior to 1979, The Embroiderers’ Guild, Queensland Inc. used the logo from The Embroiderers’ Guild (London). In 1978, a competition was held within the Guild to develop a logo that would be more representative of the Queensland Branch. Members were invited to submit concepts for an insignia. In July 1978, the design submitted by Esme Duncan was judged by popular vote as the winner. Esme Duncan was a person much admired for her original drawings and many talents. Her design was regarded as the best technically and was the design most widely endorsed by the membership. The design had modern clean lines and was not too complicated which meant that it could easily be adapted in badge and stationery formats. The new logo first appeared in the April 1979 Guild newsletter. Since this time, our iconic logo has been proudly incorporated into the Guild’s letterhead and members’ badges. Esme Duncan’s original competition entry is on display in the glass cabinet at the entrance to the main Guild room. In the same display in the cabinet, is the logo sent from the London Guild, which our Guild used before 1979.